It their line of faux Old Time Radio shows the H.P. 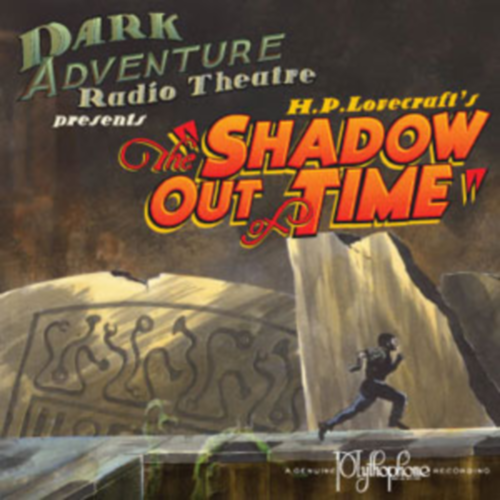 Lovecraft Historical Society has also adapted the old master’s The Shadow out of Time. 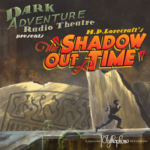 After the slightly disappointing At the Mountains of Madness and the great Dunwich Horror we now look the The Shadow Out Of Time – not quite what I would have expected for an audio drama treatment. As usual you can get the audio both as a download and in the physical CD form, the latter is enhanced with certain goodies. The HPLHS started off as a supplier of props for Lovecraftian role-playing games (both pen-and-paper, and live action). 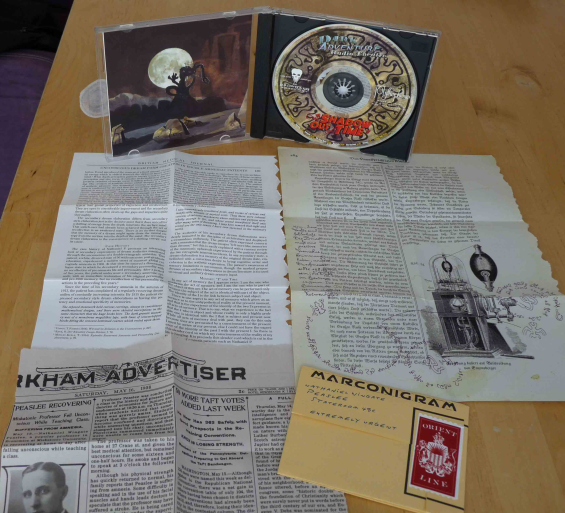 This CD is no exception and so you can find a cutout from the fictitious Arkham Advertiser printed on real newspaper paper, a sealed Marconigram (a telegram), torn pages from a psychological journal detailing the case of Nathaniel Peaslee, and finally a very well made faux facsimile page from the infamous “Von Unaussprechlichen Kulten“. The latter being in absolutely perfect German. Not that you will actually need any of these things but they are fun to look add and just add to the impression that this is a quality product. The story tells of Nathaniel Peaslee, Professor of Political Economics whose mind gets exchanged by an alien entity from the Great Rave of Yith who are time travelers from earth’s distant past. The strange behavior of the entity in his body alienates Peaslee from his family and friends, and he becomes a celebrity patient among psychologists. When the real Peaslee is being sent back into his body with no memories of his experience he is shocked to find his life in shambles and is soon confronted with nightmarish visions of his life as a captive of the Yithians. Eventually he becomes involved in an archeological dig in Australia that is about to uncover the remnants of the ancient pre-human city along with the Yithian arch-enemies that still dwell there. Lovecraft’s usual topic, of showing the insignificance of human kind in light of some alien being or race who could eradicate it in the blink of an eye, is emphasized by the fact that even these powerful beings can be overcome by some more powerful than they are. Let’s face it, you don’t read an individual Lovecraft story for the action or suspense. It’s more the joy of unveiling the cosmology that connects most of his literary works. The Shadow Out Of Time is no exception, if anything it is an even more than typical example. I mean it starts with an alien hijacking a professor of *Political Economics* of all things! (Dear students of Economics, this is nothing personal but you must admit that the discipline does not quite come to mind as the starter for a horror story of cosmic dimensions) A sizable part of the story consists one massive infodump detailing the culture and society of the Great Race of Yith. In it Lovecraft even goes so far as to classify the economic and political system (I can see a pattern evolving) of the Yithians, which he dubs some form of “socialist fascism”. All of this is delivered in the form of a letter to Peaslee’s son and the world at large. Not an easy thing to turn into an audio drama. However, the HPLHS managed surprisingly well to create a more dynamic form of presentation. First of all, when the story starts on the ship bringing Peaslee home from Australia the audio drama introduces the ship’s doctor as a counterfoil so that Peaslee can actually tell his story to someone. Peaslee’s research into the lost years of his amnesia during which his hijacker traveled the world in search of arcane knowledge is made more vivid through a conversation with a Swedish librarian, and so are the flashbacks into his incarceration in Earth’s distant past together with fellow prisoners from other ages and places. These diversions from the original story all serve to liven up the dramaturgy without changing the essence of Lovecraft’s Shadow Out Of Time. As usual, the production and voice acting are great, especially considering that this is not an entirely professional production. The HPLHS are hobbyists who, in spite of the love and attention to detail they pour into their products, have not lost their sense of humour. Thus, The Shadow Out Of Time is the first Lovecraft adaptation to my knowledge which features product placement (Fleurs de Lys anyone?). 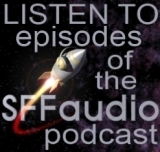 It is not least this tongue-in-cheek humour that helps to turn an slightly stuffy tale of pre-historical kidnapping with cosmic, nay, titanic dimensions into an enjoyable audio drama. Highly recommended.